All cleaned up but with nowhere to go, Monkey and Elephant go gadding about in this latest installment of their early-reader series. In the first of three brief chapters, Monkey cleans her small pink ears, Elephant cleans his big, blue ears, and they admire how nice they look. In fact, Bernstein’s distinctive, digitally rendered characters find themselves so fetching that Monkey declares that they look too nice to stay home. 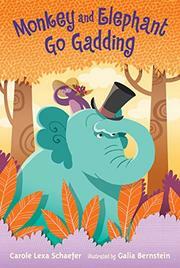 She suggests that they go gadding, which she helpfully defines as “walking along, looking around, finding something fun, stopping awhile, then moving on.” In the second chapter, the pair happens upon Elephant’s uncle Phump, who has taken up millinery and gives them the delightful opportunity to select hats from his collection. Newly hatted, the friends go gadding again, only to run into Monkey’s cousin MeeMee, who surprises them not with a new hobby, but a new family when she introduces them to her three babies. Monkey’s hat comes in handy as a cradle of sorts for the little ones when they nap, and then she and Elephant get to have a visit and a snack together with MeeMee before they resume their gadding.